‘I always remember going into the Da’s shed out our back and especially if it was raining. He had an old motorbike in there that I used to kick-start and off it’d go, just as well I didn’t know how to put it into gear. And the place would fill up with the fumes from the engine and all. When the Ma’ got all modern she decided that she didn’t want her old kitchen dresser that came out with them… from town. The top half went into the fire but the bottom part went into the shed for the Da’ to store all his good stuff in, glass jam jars full of broken pencils and stubs of old candles and stuff. I used to love pulling out the old drawers and having a good old pooch in them. I’d count out all the different size nails and screws and all the old washers he kept in there. 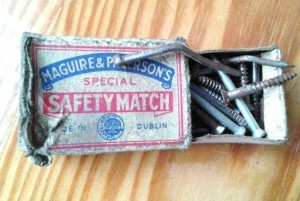 But most of all I used to love delving into the match boxes that he kept in one drawer in particular. Now, I have to say that they all looked the same and had the same things in them except they were either rusty, bent or both, with the promise that he’d sort them out some day.